This weekend we celebrate Palm Sunday- the beginning of Holy Week. You’re all invited to attend our Holy Week Services which are listed elsewhere in the bulletin. Make this sacrifice of time to the Lord and you will not be disappointed! Also this weekend we are kicking off our celebration of the 2019 SJA Dinner Auction- At Bat for SJA! Join us after Sunday Masses for Donuts, drinks and fellowship in the school cafeteria. There will be information about the dinner auction including display boards detailing our Fund-a-Need- a renovation of the Parish Center/School Gym. There are still a couple of weeks to register to attend the auction or assist in other ways. You can go to http://atbatsja.givesmart.com to register. Or, if you don’t do computers, just give us a call at the parish office and we’ll get you signed up and ready to go! Finally, I want to say thank you to parishioners Francie and Steve Valenta. For nearly two decades they’ve coordinated our efforts with the St. Patrick Center Casserole Program. Steve and Francie have decided to step aside and pass along the ministry to someone else. Please join me in thanking Steve and Francie for their many years of service to the poor and the St. Joan of Arc community. And welcome John and Mary Beth Fisher who have graciously agreed to take over coordinating our efforts. We’re going to introduce some new elements into our ministry with St. Patrick’s Center- but that’ll come in another email. So, the Spirit is moving here at SJA. There’s more to come following our first round of meetings following the Parish Life Initiative. Keep an eye on the bulletin for more information regarding outreach to new parishioners, social justice concerns and an increased emphasis on caring for our planet and natural resources. Happy Holy Week. Know that you are loved dearly and prayed for daily. It’s time to turn our attention to the coming celebration of Palm Sunday, Holy Week and Easter Sunday. Our celebration of these all-important Days can inspire and instruct us in the Christian life like no others. So, I’ll invite you to participate in them. Our Celebration of the Lord’s Supper with be on Holy Thursday at 7pm. We’ll celebrate the Eucharist and the Washing of the Feet. If you’d like to have your feet washed as part of the Mandatum, please contact me directly: cholway@stjoanofarcstl.com. We need 12 people to volunteer, please. The Celebration of the Lord’s Passion will be on Good Friday at 7pm. The Veneration of the Cross followed by the Solemn Petitions are the keystones of this celebration. The Easter Vigil will be celebrated on Holy Saturday beginning at 8pm. We will receive two people into the Church at the Easter Vigil. The Sacraments of Confirmation and First Communion will be given to them from the Treasury of Easter Life. I hope you will join me for these solemn, joyful and prayerful celebrations of the Church’s Liturgical Life. We’re also focused on the Dinner Auction which is now 1 month away. If you haven’t registered yet, you can go to http://atbatsja.givesmart.com. Or, if you don’t do computers, just give us a call at the parish office and we’ll get you signed up and ready to go! Know that you are loved dearly, and prayed for daily. There’s a few tables left for the school trivia night! Well, how’s your Lent going? 1. I want to invite you to attend our Lenten Parish Mission on March 26, 27 & 28(T-Th), 7pm-8pm in Church. Fr. Simon Felix, a Dominican Priest, will be leading the Mission. If you’re in need a spiritual pick-me-up I hope you’ll come. If you need a little inspiration, I hope you’ll come. If you struggling a bit and need some encouragement, I hope you’ll come in. If you need a break from the craziness, stress, or boredom, I hope you’ll come. If the Lord is consoling you now and everything is going your way, I hope you’ll come. There’s going to be a little something for everyone. Give this time to the Lord and He will not leave it wasted. 2. Our parish Penance Service is scheduled for Monday, April 1st at 7pm in Church. If it’s been a year since your last Confession, you’re due. Come on in and celebrate this Sacrament of Healing and Restoration before our celebration of Easter. Big sins, little sins, lots of sins, not so many sins- Forgiveness and Second Chances are available from God’s Abundant Willingness to hang in there with us and call us to become those people that we were created to be. Donuts this weekend! Come over to the school cafeteria after Sunday Masses for some fellowship! Happy Lent. We’ve begun our Lenten observance in preparation for the celebration of Easter. A few things to keep in pray with here. A big thank you to everyone who participated in the Appeal for our Sister Parish in Guatemala. We are assisting them in building a church on the parish grounds. We’ve raised $13,413.25. That number automatically gets doubled thanks to an anonymous generous donor who has matched every penny that we’ve raised. Our total gift to Fr. Sergio and the Community of Hope in Guatemala is $26, 826.50. WOW!! Once again, SJA is a witness to the generous hearts of Christians. Thank you! Here's a special opportunity to support our school community. 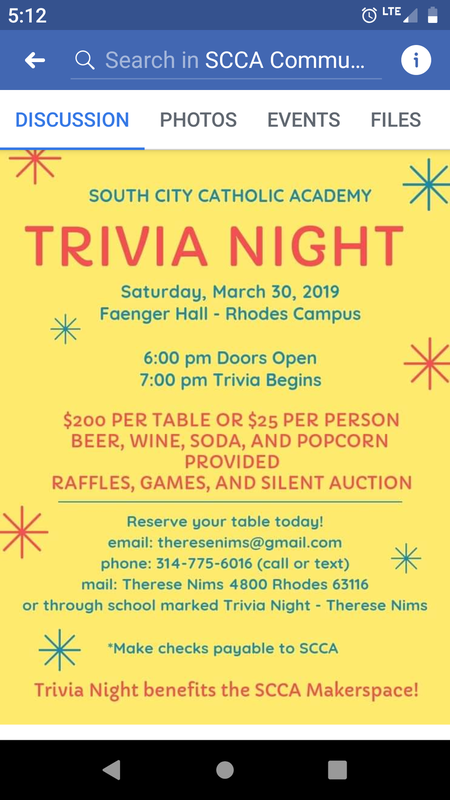 There’s a Trivia Night to benefit South City Catholic Academy on Saturday, March 30th, 6pm at the Our Lady of Sorrows Parish Center- Faenger Hall. It’s $200 for a table and all the fun that comes with a Trivia Night. The contact is Therese Nims at (314) 775-6016 (call or text) or theresenims@gmail.com. Please consider putting a table together and joining in the fun. All proceeds benefit the South City Catholic Academy Makerspace. Let me know if you need more information. It’s with a grateful heart that we recognize the retirement of Ed Ortleb as SJA’s St. Vincent de Paul Society Conference President. Ed has served faithfully for years and years. Ed- thank you for your generous service to the parish and to the needy who come to us asking for help! I’d like to thank Denny Brennan for agreeing to serve as the new President. Denny will assume leadership responsibilities immediately. Thank you, Denny, for being willing to serve. To that end, I am pleased to announce our third Parish Life Initiative Apostolate Meeting on Monday, March 25 at 7pm in the parish office. Our topic is Social Justice, Outreach to the Poor and our St. Vincent de Paul Society. We’ve got a lot of great ideas to expand our outreach to the poor both in our neighborhood and beyond. So, if you’re interested in getting involved and have some ideas to share, please join me, Monday, March 25 at 7pm in the parish office. So, here’s the line-up of the Parish Life Initiative Apostolate Meetings scheduled so far. All meetings will happen at 7pm in the parish office/rectory. Please contact me directly if you have any questions or would like more information. There are more Apostolate meetings coming, so please keep an eye on the bulletin, web site blog and Facebook page. 2019 SJA Dinner Auction: At Bat for SJA! Here’s a link with more information about the Dinner Auction and to support it! I’d like to invite all those interested in the New Parishioner Welcoming/Mentoring/Outreach Apostolate to attend our first organizational on Tuesday, March 19th at 7pm in the Naeger Room. The first things we’ll need to do is come up with a new name! ;-) This new apostolate was a top priority from the All is Gift Survey and the Parish Life Initiative back in January. We have new parishioners join every month! At our meeting on March 19th we’ll brainstorm about what we can do to invite, welcome, and empower new parishioners to enter into the parish community feeling welcomed and appreciated. Some preliminary ideas from the PLI were: monthly ‘welcome breakfast’ with the pastor with tour and introduction to the parish; home visit from current parishioner to meet and greet; monthly BBQ or ice cream social after a Mass; developing a welcome packet with information about getting involved in the parish community. All great ideas! So, let’s get together and hammer it out. If you’re interested in being a part of the New Parishioner Welcoming/Mentoring/Outreach Apostolate- and you have an idea for a new name(! )- join me on Tuesday, March 19th at 7pm in the Naeger Room to brainstorm and develop a new way to extend our famous SJA hospitality to our new parishioners. Then, on Wednesday, March 20th at 7pm in the Naeger Room I’d like to invite all those who are interested in helping SJA Go Green! The care of our planet, the preservation and conversation of our natural resources, and the way in which we use and consume energy, food, water, and other natural resources has ramifications beyond our time and life on earth. SJA can help care for our common home by examining how we use and consume, preserve and conserve our natural resources. Some initial ideas from the PLI: going Styrofoam-free at fish fries, homecoming, and donut Sunday; being more intentional about recycling; buying from vendors who use recycled products or support conservation efforts; complete the transition to LED lighting throughout the campus. Let’s get together and talk about this, make an assessment, brainstorm and see where we as a community can work together. Join me on Wednesday, March 20th at 7pm in the Naeger Room to assess, brainstorm and implement a way of life now that will preserve God’s Creation for our children, grandchildren and beyond! Please see the annual Lenten Brochures in the back of church this weekend. It contains a lot of information about what’s going on around the parish community during Lent, including the Parish Lenten Mission scheduled for March 26-28 (Tues-Thurs) at 7pm. Lent begins with our celebration of Ash Wednesday- Masses are at 8am and 6pm. It’s time to start talking about baseball. Pitchers and catchers reported to Spring Training on February 12th and their first exhibition game was on February 23rd. Opening Day for the 2019 Cardinals Season is April 1st and the Home Opener is April 4th. I’m optimistic about the Redbird this year- it looks like a good roster provided everyone stay healthy. But, I’m even MORE optimistic about this years Dinner Auction- AT BAT FOR SJA!!! Play ball my friends! Why: To Support the Mission of SJA and enjoy a good meal, fun and fellowship. Event Reservation Postcards will be mailed out on March 1st. The Committee, led by Jeff and Annie Niklawski, has been working for months already! I guarantee a good time. It’s a privilege to be able to introduce this year’s Fund-A-Need: A Revitalization of the SJA Parish Center. The SJA parish center was built in 1981. Since then it’s seen almost 40 years of sports, flea markets, trivia nights, Homecomings, meetings, gatherings and parties of every stripe and color. About a 10 years ago the bathrooms were updated and two years ago it got new air conditioning and heating. Now, it’s time for a cosmetic revitalization! Parishioner Julie Abner, owner of Julie Abner Interiors, LLC is leading the design and bid-out process. (Julie was an instrumental part of the church renovation project back in 2008-2009.) The revitalization of the Parish Center will be a boon not only to the SJA community but also the SCCA school community. The total scope of the work will depend on how much money we can raise at the Fund-A-Need portion of the Dinner Auction. - New flooring, paint and lighting in the entrance foyer. Including the SJA logo in-laid on the floor. - New flooring, paint, lighting and redesigned layout for the two concessions stands. - New paint in the gym. - And if we hit the jackpot- a new floor in the gym. We hope you can attend the dinner auction, maybe invite some friends and bring a whole table. If you can’t attend the Dinner Auction please consider supporting the Auction by donating an item to the Silent or Live Auction. No item is too small and no item is too big! (Rumor has it Monsignor Dempsey is looking for a puppy!) We’re in need of items like restaurant gift certificates, golf outings, sporting and concert event tickets, vacation rentals. The Auction is also registered at Target and on Amazon. The Auction wreath is on the Choir Loft Door in the back of church if you’d like to take an ornament and donate that item to the Silent or Live Auction. We’ve also got a Facebook page. Find us at “At Bat for SJA”. There’s more information elsewhere in the bulletin. Keep the Dinner Auction in your prayers: our Prayer of Petition is for a successful and fun evening! All to support the mission and ministry of SJA! On Monday, February 18th, the Parish Life Initiative ad-hoc Steering Committee will meet to debrief our Initiative meeting from January 20th. At this meeting we’ll summarize the comments and suggestions and develop a game plan to respond to questions; respond to immediate concerns; and prioritize our implementation steps. Please know that I’m already meeting with parishioners who have enthusiastically responded to the Initiative and are already looking to start new or revitalize existing apostolates. We’ll continue to disseminate information here, the web site blog (located here: http://www.stjoanofarcstl.com/news/) and the parish Facebook page. Don’t forget to sign up to participate in the annual Progressive Dinner. Held on March 9, this is a great opportunity to come together as a community, meet new people, enjoy food and fellowship and trash other people’s houses! (Just kidding!) Come be a part of the fun!